I have started cosplaying about half a year ago and I´ve got four of Clara´s outfits. I love Clara and she´s my favourite companion so far! I'm 24, from France an a very new whovian - actually discovered the series less than 2 months ago, but I already watch 7 seasons + 1 movie + 2 torchwood seasons. Obviously got hooked ! o/ I'm looking forward to see the older seasons as well. I have never done cosplay yet BUT Ten was a must-do. I look a bit like him and I actually act a LOT like him! And I'm very fond of crafting stuff. So here I come! I'm still wondering what costume I'm going for though, propably his blue suit And would love to make a lot of little props too. I am a 27 year old cosplayer from the United states (currently residing in Ohio), and while I am fairly new to the Doctor Who cosplay scene, I have been a fan of the show for quite some time. I look forward to getting to know you! 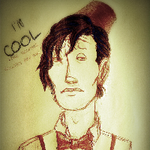 My name is Noah and I'm a 17 year old male from Australia and I am just starting out cosplaying as the Tenth Doctor. As I've said I'm very new to this but wish to maintain cosplaying as a hobby while practicing my photographing and photo editing skills and character portrayals. I'd like to thank everyone behind Doctor Who Cosplay for being so welcoming and friendly. I'm planning to do other cosplays from other realms such as Back To The Future and perhaps Bioshock: Infinite. I'm a 19 year-old French guy, I've been a huge fan of the series since I was 15 ans I started cosplaying with the Fifth doctor, a costume which have been upgraded through the years. I've also started cosplaying the Sixth Doctor since the beginning of the year. I've seen all of the classic series, all of the new series and I listen to quite a lot of Big Finish (that explains how much I love Sixie.) ; and I'm quite pumped for the next series ! I'd love to own a really high-quality costume from Steve Ricks or something like that eventually, as I'm quite impressed by his work. And... that's pretty much it ! I hope I'll find interesting DW-cosplay related content here ! I've been a Whovian since Tom Baker, but never made a costume until this year. My first was from the Wedding of River Song, and I'm looking at a Missy costume next, then maybe Rani! Hello! I'm a Whovian from California, and I've been watching since the reboot. I'm currently working my way through Classic Who, but in the meantime I'm interested in cosplaying a variety of DW characters. I can't wait to see everyone else's cosplays. Hi,I am a Whovian from the UK,I cosplay the Tardis now whenever I can,My ultimate plan is to get 13 Tardis's and all 13 Doctors (12 + War Doc) in one room,for one awesome photo I am probably older than most of you,if not all,But then for a blue box I look OK I am always looking on ways to improve my cosplay ideas currently working on a independent sound chip instead of my phone for sounds,and a K-9 for companionship of course. Hi, Romola here, from Greater London. I have recently started cosplaying as Missy and an still perfecting my outfit. I'm Richard from the sunny United Kingdom.